note: screws are in a box, not a bag like most sections. Hinge on the bottom hinge broke.. be veeeery careful…. I received two top hinges and no lower hinge. Be careful the hinge breaks easily.. it happened to me. Thanks, held on to mine with vice grips from the meaty part. Good looking out! Just broke the male end off of the Einsy-hinge-top. What hind of material is it? Can I glue it back on? It’s printed from PETG, but you can also re-print it from any other material. You can re-glue it in the meanwhile. I received a spiral instead of a textile sleeve…? Hey Phil, you can also use the spiral wrap instead of the textile one. I forgot about this being temporary, and then went back and tidied up the motor end of the textile wrap. The zip tie doesn’t really grip. I may just remove it, but it’s on there for now. With the Einsy case I had run out of M3x10 screws. You will need to add more spare screws for this case and M3 square nuts also, I had to use my last 4 spare nuts on this case also. I had to purchase extra screws from Amazon. Hi Stephen, in the assembly kit this is covered. In case you print the new parts on your own, you need extra 4x M3x10 screw and 4x M3nS. The EINSY RAMBo motherboard was shipped with an open Static Shielding Bag. Is that normal? It looked like it had been opened before. Yes, it’s normal - the board doesn’t need to be fully sealed for transportation. I ended up putting the screws on the board first then finagling it into place. This avoids the screw placement challenges when the board is already in the housing. I suggest swapping steps 10 and 11. That way it’s easier to get the nuts into the tight slots without risking damage to the EINSY board. I agree with swapping steps 10 and 11 …as long as the nuts are always interference fits to the slots ….ie, the nuts don’t fall out. If the nuts are loose, then you can try pulling them more with a screw before mounting the Einsy board. In my case, the nuts were loose. I used masking tape to temporarily hold the nuts in place while installing the board. Three out of the four M3nS nut slots were too small requiring careful filing before they could be installed. Good think I had a set of small files! I also had to use a tiny file to open up the holes for the M3nS nuts. I had the same experience as Jerry did, the slots were very tight. Luckily I was able to open them just enough by inserting the closest sized hex wrench and spinning it around to open just enough space. I did have to use quite a bit of force to get them to go in. In future releases it might make sense to do this part before step 10. I was worried about damaging the board. I think if I had known this was coming up, I would have preferred to put these nuts in before mounting the Einsy board. Less chance of damaging it. I have to agree with the comments above. I’m glad the slots are tight, so I don’t have to worry about losing the nuts before they’re secured with the screw, but the force required is disconcerting with the board mounted. I don’t see why this can’t be done first, which would be safer. I used an X-Acto knife to shave away a bit of extraneous plastic inside the slots and that allowed the nuts to finally go in. It would be good to specify the insertion of the M3nS nuts into the traps for the heat bed and extruder cables as separate points in the text for people who don’t scrutinize the pictures, as myself. Otherwise it is easy to forget. Hi, thank you for your feedback. We will improve the note. I listened to Mark and inserted S nuts before motherboard and didn’t have much trouble. turn the screws until you can slide the base in with a little pressure, then with your tongue out the left side of your mouth, uut the ball end of the hex key through the ventilation slot on the einsy base. Solution - screw in the screw more so there isn’t much left to screw in. Then, press it all together and since the screw has moved in a bit, you can get around the solder joint and turn it another 1/4 turn to make it tight. Hey Evan, if you follow the manual closely you’ll see that it’s not hard at all - just need to use the key at the correct angle. Continue to love my balldriver set! It just needs some patience, but it works good. Two things. First, put the screws into the frame as far as possible while still being able to slide the base on. Second, make sure the base is pushed in all the way such that the edge of the housing is flush with the frame, otherwise it will seem impossible to get to the top screw. As long as you’re using the correct allen key, neither of the screws will be hard to reach. works like a champ and love the design of how you access the one screw. One might forget there are 2 Z axis motors, the one pictured here is the one next to the power supply which should be resting on your work surface. There is no zoom-in version of the first picture. Hi there! It works for me, just click on the magnifying glass. I found this step very difficult. Getting the cable in without flexing it too much was a real problem. No worries, this is rather a nice-to-have part of the assembly, nothing crucial. Just a reminder, you’re threading the cables in the SIDE of the aluminum extrusion, not the BOTTOM where the rubber feet are. Maybe it’s just too late at night but it took me a try before I realized this. YES. It is very unclear from the text where to do this, and I nicked a wire removing the cables. I also thank you. I didn’t catch this until after I already put them in the bottom and then read your comment. I had to redo it. Should have read your comment first! Please have TWO gummy bears for me, with my thanks!! This step was difficult as well. Same concerns about over-flexing the ribbon cables. Some better cable management approach for the ribbon cables would be nice. Rubber feet should be taller. this cable bundle loose and pretty flat but it will still touch the table. Make sure to follow all the steps carefully and the bundle won’t touch the table. My bundle was touching the floor as well. Cut the tie, reorganized the bundle a bit, and now it clears the floor easily. I think these (Prusa) guys have done this once or twice before ;-). I think is the only spot where the risk to damage the ribbon cable is real. The zip tie is pushing directly against the ribbon in a corner. I took a piece of shrink-wrap, cut it along the side and used it as a protective barrier between the zip tie, ribbons, and around the outer corner. A small piece (3cm) of textile wrap here would be perfect. Agreed. I printed a short, flat cable anchor to keep the bundle off the table (https://www.thingiverse.com/thing:341067...). I’ve double and triple checked, no extruder-cable-clip included with my MK3 kit. Hello, thanks that you have contacted us by email, we will send you the missing parts. I didn’t receive the cable clips either. I’m sorry to hear that, please contact us via our livechat or e-mail to info@prusa3d.com, so we can arrange for the missing clips to be shipped to you. I have just run into my first missing parts problem (so close to the finish line). Although I have a kit with a textile sleeve for the heatbed cable bundle, I don’t have a cable clip. I have checked through everything I have left (which is not much) a couple of times and there are definitely no clips. I don't have the means to print one for myself because my old printer is no longer operational. How can I obtain one? In the meantime can I carry on with the connections and add the clip later? I also had the problem of both these clips (also extruder cable clip) being missing, I realise it was not in the bundle of files to print before starting assembly. I just drilled two 3mm holes in the area where the clip would attach and used a cable tie. I had an issue with this part as well. The heatbed-cable-clip is a bit to thick (the side that goes inside the door part). Although everything is fitted quite nicely, the door would not close. After cutting away approx. 2mm, the door closes now and can be shut with the 40mm screw. When zooming the second photo the first one is shown. I’ve checked it and it’s working as intended. Are you sure you clicked on the right picture? The wires on the PSU and HB that I received are actually black and red with a black stripe. I’m reasonable sure the red wire is still positive but this might be confusing to other people. I agree! Why not make positive ALL red and negative ALL black? 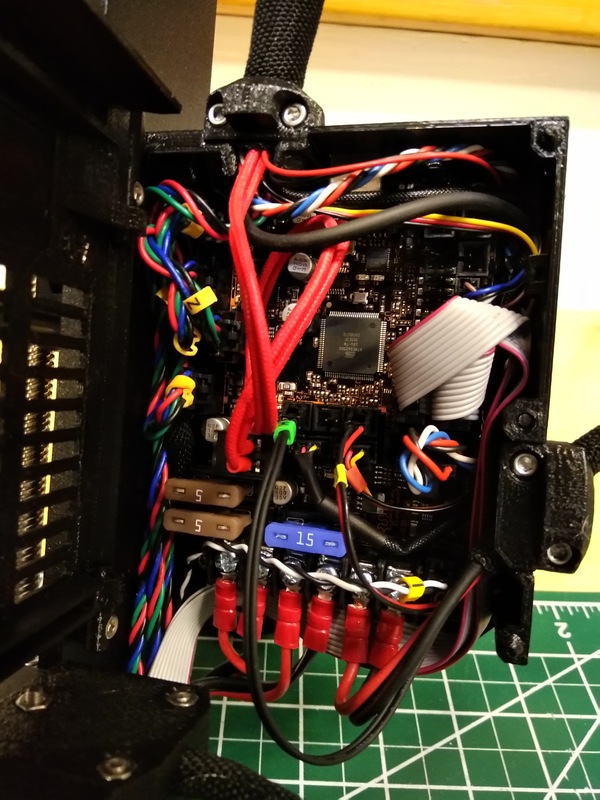 I think it would be a bit easier to connet the PSU and HB wires to the EINSY board without the door mounted to the frame. Maybe move the steps for mounting the door after the PSU and HB wires are connected. Eddy Gleason is correct, especially if you’re right-handed. Loosen the screws holding the case to the frame and slide it off. Connect the power cables, then slide it back on and tighten the screws. Much easier than fighting the cables while the case is fixed to the frame. Chiming in on the confusion, I have red/black wires so it’s pretty clear which side is positive. However, due to poor extruder control or the way the wires split, my black wire has a stripe of red (from the other side) and the red wire has a stripe of black (from the other side) so that’s nice. I hope I don’t start a fire. Suggestion for the Prusa team: use black and red crimps for clarity. Concure with the all red or all black wires as the half colors and stripes are unclear. Colored crimps would also be a serious improvement. Yes, this is important, luckily you just need to follow the 3 photos one by one to get the cables in the right order. ignore the answer from @Martin L. The two pairs from the PSU have no “first” or “second” pair. It’s just confusing wording in the main text. You can put them on either the A or B connection, but be 100% sure that you don’t mix Plus and Minus. Hello there, you are partially right. What ment by my comment is that the + and - cable of the same pair have to be next to each other, as shown on the photos. The order of the PSU pairs does not matter (as clearly stated in the previous step), however, the heatbed power cable shall be at the right-most position. Something for Prusa to be aware of; my heat bed has ring terminals on the wires which doesn’t fit the EINSY board without trimming the width of the terminals. The PSU has spade terminals like the photos which fitted fine. Hey Luke, the ends with ring terminals should be used on the heatbed side. This is confusing - I see someone tried to address that above, but was given another confusing answer. There doesn’t appear to be a way to tell “the first wire from the PSU” and the “second wire from the PSU” so, I assume they are the same, as long as the polarity is kept. It is a bit confusing when describing the two PSU *power lead pairs* versus the two wires (plus and minus) within each pair. Either PSU PAIR (a plus and minus) can be used on the first set of connectors, the remaining PSU pair used on the second pair of connectors HOWEVER within each pair the polarity is critical. So pick EITHER PSU pair (a plus and minus) when starting but ensure you get the polarity correct. Then take the remaining PSU pair and screw into the second pair of connectors again making sure the polarity is correct. The provided phillips screwdriver is not the correct one for the terminal screws. These require a PH2 or a flat head for proper tightening. The supplied screwdriver can be used to tighten the terminal screws. As many others already noted, the positive cable is half red and half black, while the negative one is almost completely black with a veery tiny stripe of red. Might be confusing for some. The one with more red is the positive, though! Also, to make it even clearer it might be interesting to add a photo from the other side. For me, the red stripe was perfectly visible from the other side, meaning on a photo you would see (left to right) black-red-black-red-black-red cables. This is already written well to ensure one does pay attention, but another point of view might be even better. My black and white twisted cable was not long enough to go up and then back down like in the picture. I don't suppose it matters though. Mine also, assuming it doesn’t matter as long as you have clearance for the upcoming wires. Minor nit - “Find the twisted pair (black and white | PP) cable from PSU and connected it to the board “ should read “Find the twisted pair (black and white | PP) cable from PSU and connect it to the board”. A REALLY minor nit in an otherwise spectacularly well-translated assembly manual! My nylon filament wasn’t long enough. It didn’t poke out of the cable bundle. Hey Zachary, please measure the filament. If it’s not long enough (50cm) you can always contact our customer support and request a replacement. My nylon filament also is not long enough. Is your filament below 50cm? If it’s not long enough, then you can contact our support for replacement. Once you execute next step (30) you will find out that the filament wasn't too short, after twisting the textile sleeve. Filimant hole require drilling as the filiment would not even start into hole. Considering the problems I had with the filiment, I wonder if I got a piece that was over size? Hi Jerry, the hole is designed with filament tolerance in mind, but it might be possible it is slightly smaller and the nylon bigger than usual. Carefully widen the hole or contact our support. Same issue, nylon filament measures Ø3.3mm, instructions said it should be Ø3mm. Forcing will undoubtedly break plastic printed part. Same here, just measured mine and it’s also 3.3mm. You can always trim the end a bit using pliers, cutters or exacto knife. Should list x2 M3nS nuts on this section for the M3x10 screws to grab onto. Hey Brandon, those are listed few steps before this one. Filip Misiło - Actually it isn’t. I was wondering about this as well. But I could not find any Step that listed adding the x2 M3nS nuts to the Extruder-cable-clip before attaching to the RAMBo-cover-base. I had issues getting the sleeve and filament in to position that wasn’t too far in for the filament or sleeve to far out, or the corner of the outer wrap of sleeve sticking out of the clip. Thanks for this - the temporary zip tie worked really well for me to get everything seated and put together. Consider a more visible color for the nylon filament. Black is a bit difficult to see. I had the same issue fitting the nylon filament into the hole. I just trimmed a piece into a point and it made sliding the filament in much easier. However, I could not manage to get the wires and the sleeve to be in the holder. I had to peel the sleeve back to be able to secure the holder around the wires. Get the clip FULLY seated before tightening the bolts. I snapped the clip during initial attempt. Fortunately, was easy to weld back together with a low temperature soldering pencil. Will print a new one later, but the repaired clip worked fine once the entire cable assembly and clip were fully seated before tightening the bolts. Tightening the extruder cable clip around the sleeved cable is a complete pain. Two things that made it easier and allowed me to close it up 100% without feeling that I was going to snap a part: 1. gently twist the sleeve to pull it out of the gap between the clips while tightening. The sleeve gets compressed in this gap and makes closure impossible. That worked great on the first side. 2. when twisting the sleeve wasn’t enough on the second side of the closure, I poked a shim (thin nail file in this case) down the hole to push the sleeve out of the gap. After that, closing up the extruder cable clip was a breeze. It also helps to have the sleeve twisted tight around the cable bundle before you start. This bundle needs to be as compact as possible before closing the clip. I encountered three bad M3x10 screws during assembly. The threads were damaged out of the bags making this step very difficult until I figured out the threads were bad. You could tell something was amiss when screwing in the two screws for extruder-cable-clip. When initially pushed together, there was no seam but as I turned the screws, a seam appeared and widened. I replaced the two screws and the cable clip went together seamlessly. I tested the screws, all three would not thread into nuts. Be on the lookout folks, probably a good idea to test the screws into nuts at each step. Screw it , literally. I swapped in some longer bolts and blew them out the back side. The ones listed were never going to engage the nuts with that cable group in them. I ended up short 1 M3x10 screw ….even considering the spares bag. Had to cut a longer screw from the spares. I have been very careful with my fasteners and am confident I did not lose any. Also, my filament was too long by approx 20mm. I can only hope that it did not somehow pull out of the print carriage assembly on the other end…. I doubt it as I have been exceeding careful. Even the picture shown in step 31 seems to show that their filament will be too long. I was able to angle it between the X and Y axis connectors in the controls box. I I think it is important to note that the filament does not go straight down into its hole. It is at an angle. Some of those who are having to ream out their holes, maybe are just trying to insert at the wrong angle. Hello Todd, thanks for your remarks, we’ll pass it to the packing department to make sure everyone will have enough screws. Just out of curiosity, what is the purpose of the nylon filament? I think I have mine in, but not completely happy with it and the cable layout in the textile sleeve, but I think it is ok.
It’s supposed to support the extruder cable bundle. This particular step was my Waterloo on this project - I could not get the clip to close well enough to engage the 10mm screws. After (literally) hours of work, I wound up shortening an 18mm screw down to ~15mm to use as an engagement helper, and then used 2ea 3x12 flathead screws from the spares package to finish the job. I also had to snip off as much sleeve material as possible to finally get the thing to close. This was the hardest part of the build so far. I ended up using one end of the pliers in the hole that the square nut goes and the other by the screw head and squeezing it tight. Took about fifteen minutes to finish, but got it. It’s very tight, but doable. Thank you, Keith W. After futzing with this for about an hour I tried your method and had it done in 5 minutes. not sure what was worse this or attaching the nylon end to the hotend. That step was added in advance. You can always print the part yourself once it’s released. Correct, the part is mainly intended for “fresh” assembly. But I suppose it won’t hurt to add it later if you ever need to re-connect the sensor to the RAMBo board. The filament detector cable goes on the BOTTOM pins of the socket. Although the picts for this step don’t show the pins, you can look at pict in NEXT step to see how the connector goes without the aligner. Mistakes to avoid are wrong row of pins, upside down connector or having it one pin left/right of center. May be worth mentioning that even with the orange plug aligner there are still two rows and one must still pay attention to which row is used. Despite all of the warnings, with the existence of the aligner I only paid attention to getting the wire colors correctly oriented and still managed to plug the thing into the wrong row. Luckily this was detected during calibration and I was able to easily fix. Hey Jeremy, it’s actually mentioned a few times in the assembly manual - make sure to follow all pictures and descriptions closely. Hi Dennis! It’s because the other row is where you plug the MMU data cable if you have the MMU. Labeling or colo coded bands on all the wires would make ID’ing a log simpler. I got them right but checked them 5-6 times too make sure. Hi Jerry, most of the cables are labelled. Which cables you had issues with? My P.I.N.D.A cable only has 3 cable (black, blue and brown) but my board has 4 male pins. (Nr. 7). can you please advice? Thank you for notifying us! One of our packers mixed two boxes together. Please send us a photo of your PINDA probe to info@prusa3d.com and we will arrange a replacement for you at once. They sent the wrong cable to my printer (AHHH!! <— Me being frustrated. Now I need to re-work the wiring and also the P.I.N.D.A sensor once they ship the new wire. Not sure if all this time is worth it the time for this price tag. Support was not very good, just not very happy with this purchase. Hi Erick! We’re sorry for accidentally sending you a wrong PINDA. One of our packers mixed two boxes together. Being still a relatively small company, we are handling hundreds of orders every day, so mistakes happen, unfortunately. Should anyone else have a similar problem, do not hesitate to contact us on Live chat or email (info@prusa3d.com), we will do our best to help you! I don’t know if this is a more recent issue due to your increased order load, but I also have a three wire female connector on the end of my P.I.N.D.A. probe. I purchased my i3 kit in July 2018 and have been chipping away at it slowly and found this issue last night. I will try to talk to your customer service live chat to see if it can be resolved soon. My pinda probe loop, back at the probe, is a bit too big! Not enough length in the box to reach the female socket. What a pita it will be to go all the way back to shorten the loop. Can you simply send me a short extension! My kit had the plug aligner inserted in the socket for the filament sensor. I’m kicking myself for this, but I got the idea that the aligner does ALL the thinking for me. i.e. does not let me use the wrong pins. Actually it only prevents side-to-side errors. You still have to use the bottom set of pins. It says that in the documentation of course, but the photo does not have the aligner part shown, and I thought that was out of date. I inserted the connector without a care in the world, thinking it could only enter in the correct position, only to have filament sensor wiring error during self test. Easily fixed by connecting to the bottom row of pins, and gratefully does not harm the sensor. Anyway the self test now passes and I’m printing Triceratops. Yippee ! Same issue with PINDA cable it was a tad short due to my loop being a little big. With a little effort I was able to stretch the cable to make it to the connector. I also had a problem with the PINDA cable being a bit too short, and was also able to stretch it just enough to make the connection (without, I hope, damaging the cable). Strongly suggest increasing the length of this cable just a little bit. All PINDA cables are cut to same length. Make sure you do a proper loop during extruder assembly, otherwise you won’t have enough of the cable to connect it. i also had problem with the cable length of the pinda probe. but the issue is not the cable length itself, it has to do with that you are asked to make a loop of it near the extruder and if this loop is too big then there wont be enough left compare to the rest of the cables. and this you only find out much later and then have to cut the zip ties and pull some more thru. i my case i had struggled alot to get the cable bundle screwed in to the box (step 31) only to find out i needed to remove the clip again. Save yourself a whole lot of future grief by double checking the wire colors on the Filament Sensor Cable. The photo in the circle shows the correct colors (Red, Black, Blue, White, Empty). My cable was wrong making it seem that my sensor was bad. They sent me a new sensor and cable. I only replaced the sensor as I had checked the cable for shorts and opens and redoing the cable harness to the print head looked like a pain. Fortunately I noticed the new cable did not match the old cable before turning on the power or I may have killed the replacement sensor as well. My bad cable had red and black swapped at the EINSY end. I was confused for a while, please put a picture with the black stamped stripes zoomed in? You can zoom in on all the pictures, just click on them or the magnifying glass in the corner of the picture. Is there a concern with heat dissipation on the back of the board, could the LCD wires go behind the board without causing damage? Hey Russel, it’s recommended to keep all the cables as the manual says. Hey Filip, i’ve not altered my cables - my question was more one of working out if there is a better way to guide users to connect the cables beyond “shove them in and try to make it look like the picture.” The Cables that are not in the Gantry bundle could easily be routed and connected prior to attaching the einsy box to the frame (and would probably be easier to do so due to space) - adding the LCD behind the PCB would - if there was no heat concerns - clear up the front even more for attaching, and maintaining the cables from the gantry and heat bed. I’m sure there are more ways to lead the cables, but in the end it’s not an ideal solution - sometimes you might need to remove those cables, and it could be too much hassle to get them from behind the RAMBo. If there is a good reason to need to remove the LCD cables frequently - then having a rear access panel would be useful (would mean octoprint wouldn’t need to tear down so much of the build) - otherwise the odd requirement to need to remove the electronics (with an elegant layout) wouldn’t be an issue. I ended up with a fair amount of slack on the LCD cables and routed it behind the power cables and flat against the controller side of the case, then up along the outer edge of the case, behind the bed cables, and finally folded over and in to the headers. There is no need to remove it. It’s covering RPi zero pin slots. More instruction here would have been helpful. I was not sure if I was supposed to scrunch all the wires into Einsy box before closing. (I brought in my wiring expert). Also, the door would not close due to the 1/2 circular part of the door that seems to need to fit inside the door. However that part of my box forced the door to move outward and the side of the box to move inward loosing the alignment of the two holes for the long screw. (needless to say I am not an engineer) I consulted the expert mentioned above and with his help, trimmed enough of the surface of the 1/2 circular part to align the two holes for the screw. I had the same problem with closing the door. Its obviously the old design of the door (you can see it in the photos above). Will there be a plan available to print the proper door? I am using clippers to hack out the door, but it would be nice to get the proper door for this design…. I enjoyed putting this together. I learned a lot that I will be taking into my next project, and confirmed some of my designs. Quite a bit of wiring and LCD cables hanging below the box. Zip tie into a bundle? And just let them hang there? What a mess with all those wires, make it bigger, it can. I can’t close that %#*@ door. Make it wider and longer. How hard can it be. It’s crucial those wires have enough space, but they don’t have, stupid design. Hello Albert, It is crucial for the cables to be plugged in correctly, don’t be afraid to squish the cables a little while closing the case. Shouldn’t that say “Side arms (2x)”, not “Side arms (1x)”? The outer end stops on the double spool holder arms are too large. There are several filaments on the market with a spool centrum hole of just 20 mm, so they will not fit on this double spool holder. Could you, please, redesign the arms and publish the STL-file on your web site (or anywhere else)? Hey Bengt, unfortunately we can’t cover all the possible spools on the market - but we’ll keep that in mind. On my parts, both arms rotate “clockwise” for assembly (not anticlockwise as described for the left side). Mine are not fitting at all… I’ve even try pushing the left arm in it just doesn’t lock in. Please check the locking mechanism for obstacles, perhaps there’s something inside. Take the "arm" on the left side, insert it gently in the main part and start to rotate (delete anti )clockwise (towards you). It should take about half the turn to lock the part in place. Great instructions and comments section on the online manual are priceless. Keep up the awesome work………taking the world to a better place. I had trouble getting left side in, and then finally realized I had not turned the right side in enough to provide clearance for the left one. Once I tightened the right one a bit more, the left one went in easy. Mine didn’t seem to fit properly, unlike others it was too loose and would just flex back to the original position. After trying to add a little extra force (and I do mean a very little amount) the bottom tooth snapped with no warning. I’ve jury rigged the holder on with two of the supplied cable ties until a replacement arrives. Hopefully this temporary quick fix will be useful to anyone else itching to get printing only to be foiled at the final step. When the extruder head is up in the area of the spool holder bracket, the clearance is pretty tight, maybe a millimeter. No issues, but I’ll be looking at it closely if I ever do a very tall print. Make sure you mount to the back of the frame not the front! I would like to see a video of the person who could assemble this printer in 4 hours. This step too me about 1 hour 15 minutes. I’d say 1-1.5 hours is a good range. Overall a very enjoyable build. The instructions are very good though you must really pay attention to each step including looking at each photo. 4. Extruder drive belt could use 2 idler/tensioner wheels that mount on the back extruder plate that would be retained via the already present 4 plate bolts. other than that fantastic job on the build, looking forward to my SL1 build! Anyone else wish the board faced OUT, so you weren’t bumping your elbow into the PSU while trying to plug all the wires in? I’d love to know why the connectors face in. Bedankt, was een plezier om te bouwen. Complimenten voor de zeer duidelijke handleiding. I like the textile wraps. They look nicer than the cheaper looking plastic ones and I didn’t have any trouble with them.